I want cookies lots and lots of cookies. I want the pie in the skyyy. I’m channeling Calloway and the Cookie Monster today. It’s a half delusional notion, but please hang in there with me. I started a new job two weeks ago and I’m feeling winded from climbing the corporate ladder. This means less time at home, and less time doing the thing I really love to do; cooking. Besides last weekend’s catering gig, this weekend was the first time in a long time that I utilized my kitchen to nourish mind, body, and soul. I dug it. I missed it. I danced all up on it. Life felt right again. I made chicken noodle soup from scratch, and baked about 4 dozen cookies in an attempt to reclaim my sanity. It worked… I think… At least these cookies worked. In my mouth. Chunkin Punkin Cookies are soft and slightly chewy, and the crushed up graham crackers running through the batter provide a sweet crunch that will make you happy on the inside. I added graham crackers because I like cookies stuffed with crazy things like potato chips, bacon, or pretzels. I like cookies with surprises and bursts of texture. Since this cookie is loaded with holiday spice, the graham crackers work really well here. It’s like having a pumpkin pie with a graham cracker crust…think about it…but don’t hurt yourself. This isn’t rocket science. You can stuff a damn cookie with whatever the hell you want and it will taste like heaven on earth. Just FYI: Heaven on earth is stacks and stacks of cookies cooling on wire racks. Preheat oven to 350 degrees. 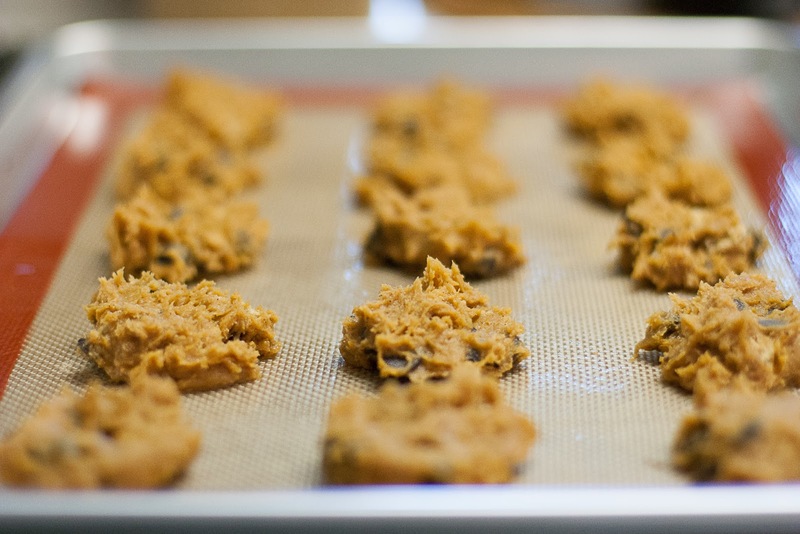 Spray cookie sheet with nonstick spray or line with parchment paper or Silpat. Using a mixer, beat the butter until smooth; about 2 minutes. Beat in brown sugar until light and fluffy; about 4 minutes. Beat in one egg at a time. Turn the mixer off and mix in pumpkin puree and vanilla. In a large bowl, combine flour, baking soda, salt, pumpkin pie spice. Turn the mixer on low and slowly add the flour mixture to the wet mixture in thirds (scrape down the sides when needed). Turn off the mixer as soon as the mixture is combined. Using a wooden spoon or spatula, stir in the chips and graham cracker chunks. Spoon a heaping tablespoon of the dough on the to the prepared cookie sheets about 1 inch apart; bake for 15 minutes, or until the cookies just begin to brown on the sides (they should look underdone). 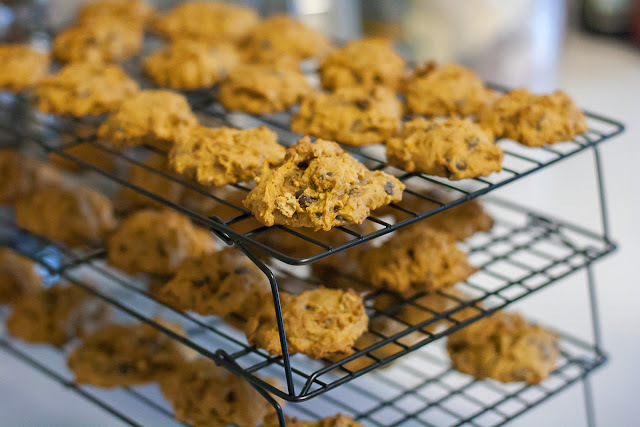 Remove the cookies with a spatula and cook on wire racks.